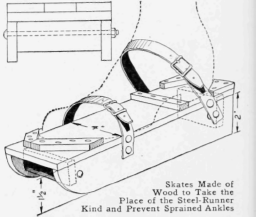 Skates that will take the place of the usual steel-runner kind and which will prevent spraining of the ankles, can be made of a few pieces of 1/2 -in. hardwood boards. Four runners are cut out, 2 in. wide at the back and 1 1/2 in. wide at the front, the length to be 2 in. longer than the shoe. The top edges of a pair of runners are then nailed to the under side of a board -A in. wide, at its edges. A piece of board, or block, 2 in. wide is fastened between the runners at the rear, and one 1 in. wide, in front. 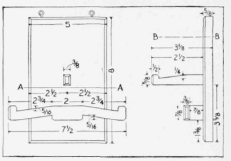 Two bolts are run through holes bored in the runners, one just back of the front board, or block, and the other in front of the rear one. Four triangular pieces are fastened, one on each corner, so that the heel and toe of the shoe will fit between them, and, if desired, a crosspiece can be nailed in front of the heel. Straps are attached to the sides for attaching the skate to the shoe. Both skates are made alike. - Contributed by F. E. Kennar, Hennessey, Okla.